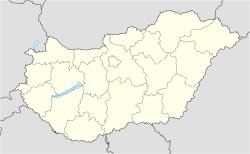 Tiszakécske is a Town in Bács-Kiskun county, Hungary and the administrative centre of the Tiszakécske District. It is also famous of its spa and recreational parks. The city has its own football club, the Tiszakécske FC. Wikimedia Commons has media related to Tiszakécske. This Bács-Kiskun location article is a stub. You can help Wikipedia by expanding it. This page was last edited on 15 February 2019, at 21:39 (UTC).